This is a sponsored post written by me on behalf of Santa Margherita. All opinions are 100% mine. Do you love reading Romance Books? Check out this great list of love stories to feed your romance, chick-lit, and new adult reading list. This post may contain affiliate links. I may earn a small commission at no additional cost to you! PIN IT TO YOUR BOOKS BOARD ON PINTEREST! FOLLOW SUGAR & SOUL ON PINTEREST FOR MORE GREAT READS! There are a lot of things I love doing, but very few are as enjoyable as getting lost in a book with a glass of wine in hand. If I happen to be doing it in a foreign country or on a beach, even better! And I hope to be doing a whole lot of that this summer since my reading list is a mile long. Whenever I share my reading lists, they’re usually a strong mix of sci-fi, romance, fiction, and more, but today’s list is all about LOVE. Yep, this list includes my favorite romance books, as well as a few my friends recommend and some that are on my to-read list! 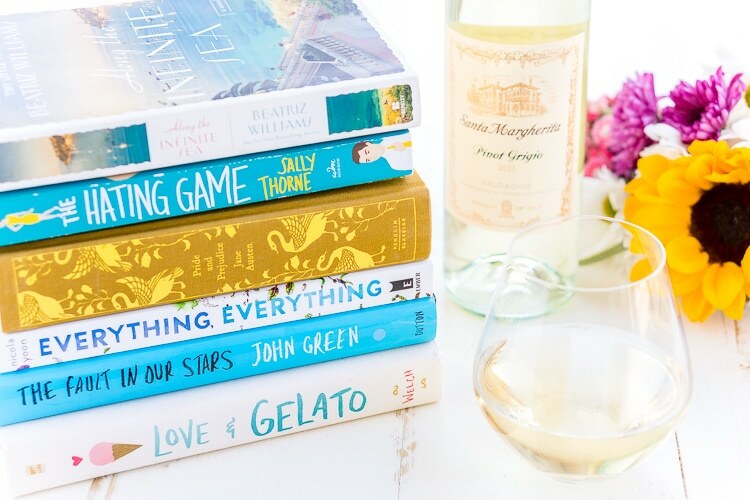 We all know that pairing wine with the right foods is important, but what about pairing wines with romance books? With premium quality Italian wines like Santa Margherita‘s Pinot Grigio, Prosecco Superiore DOCG, Chianti Classico Riserva, and Sparkling Rosé that are perfect for any occasion, I thought it would be fun to categorize this book list based on wines. Book & Wine Club, anyone? Who wants to join me? So grab a glass of wine, open up Goodreads and let’s add some new books to your own to be read shelf! And check out this list of where to buy Santa Margherita wines. I know most women love a good love story, but there are so many different kinds of them so that each wine will be paired with a micro-genre. So whether we’re having our hearts broken, falling in love on the Mediterranean, or caught up in an office fling, we’ll have our wine in hand to keep us company. 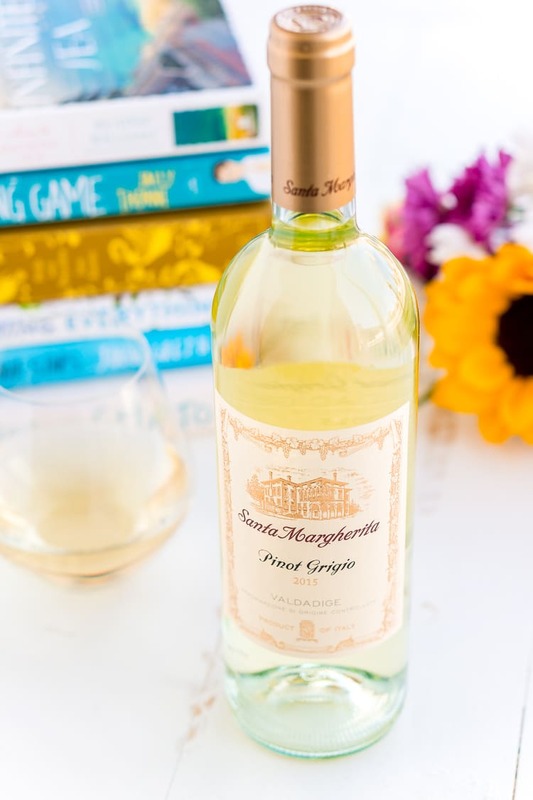 Since love and broken hearts seem to go hand in hand in most books, and it’s the longest list, I thought it seemed fitting to pair it with Santa Margherita‘s most popular wine. Maybe we’re gluttons for punishment, and sometimes we all need a good cry, but at least we’ll have our wine to console us through it. 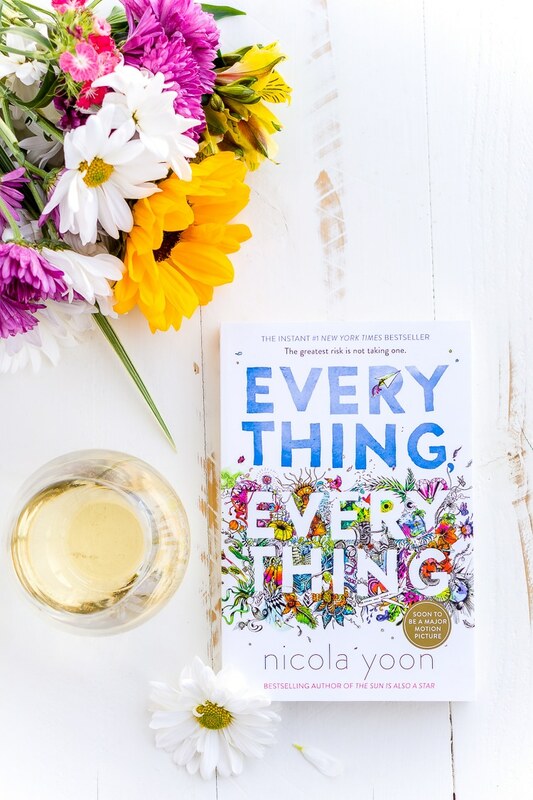 It’s 2017, and I’m not sure if any wine is more cliché than Rosé at the moment, but this one has bubbles and who cares, it’s fun, and my favorite and it makes me happy so it seemed only right that it should accompany the group of books that do the very same! Of course, we’re going to enjoy the red wine with the steamy books, but these stories are so much more than the hot and heavy scenes, they have depth, character development, and pages you can get lost in. Ahhh, the classic love story. Sure there might be a little heartache thrown in, and there’s sure to be some clichés and maybe some steamy scenes, but at the end of the day, these are pretty clean stories about two people who fall in love. I’m so glad, Grace! I hope you found at least a couple you haven’t read yet! I cry so much every time I reread Me Before You (which has been at LEAST 10x now!!) that I can’t imagine how emotional I would be drinking wine at the same time! Might have to give it a shot, though. The only other books I’ve read are The Fault in Our Stars and All the Bright Places so my reading list just got a looot longer! You’ve read a lot of downers, definitely check out some of the more lighthearted ones too. However, The Time Traveler’s Wife is one of my all time favorites… keep the tissues handy, you’ll need them! Just added quite a few books to my “To-Read” list! 🙂 Thanks Rebecca! 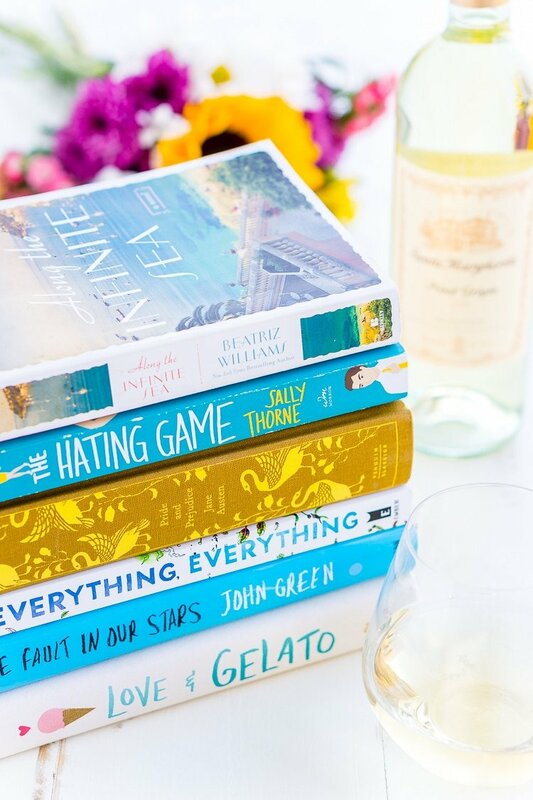 Love the idea to match wine with a good book! Perfect for us who love to read, and of course love wine. My favorite have to be the P.S I love you combo with Pinot Grigio!! <3 Great post. Thank so much for stopping by, Sara, I hope you found something new and fun to add to your to-read list!